Artists are probably the people who are less prepared to deal with social interaction and talk to the public. We're the ones that decided to stay indoors and create instead of going out. It's a lifestyle, but it means we don't build as many social skills as needed. Times change and it's expected from the artist to show our process, our story, to be part of the art and make fans part of it too. We have to put ourselves out there and hope for the best. It's our passion for our art and the respect that we have for our fans that lead us to fight these horrible monsters and deal with our social anxiety in loco. We practice in front of the mirror and try to come up with better ways to present our work and ourselves, but there is just so much we can predict and practice after all. I can say that my years working as a teacher improved my ability to communicate in public a lot. My cute little students allowed me to be expressive and to be myself. They didn't judge me and as they were honest as children can be. They taught me a lot. Talking to adults is a bit different. I am the kind of girl that Goes Big or Goes Home. 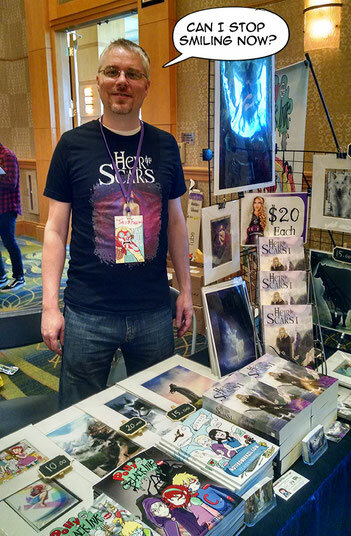 My first artist table was a huge event. 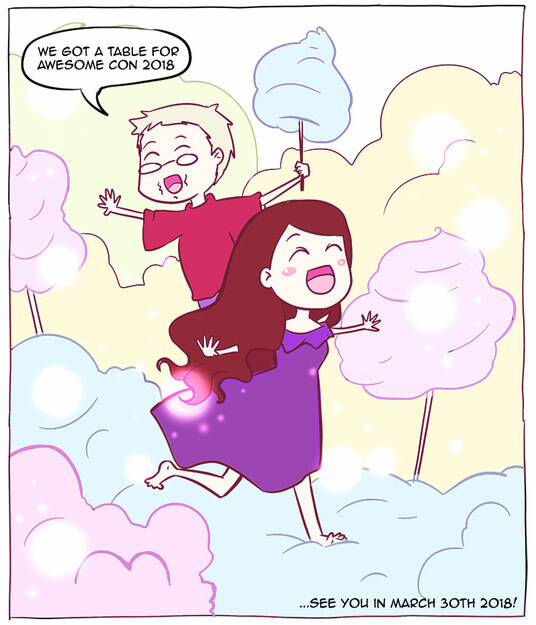 When we apply for a big comic convention as Awesome Con, we have to do it almost six months or more before to save a spot. You may think that it's good news. I have six months to prepare, right? That can be true. It's also six months losing courage every day. I confess. There are entire months that are just rough. During these introvert moments I tend to close doors and windows and focus on creating new worlds. Yeah! I was such a superhero when I said: " Yup! I'm going to do this..."
The last 24h before the event is nerve-racking. 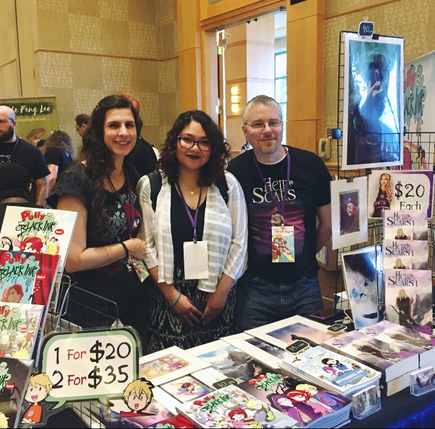 The first time (Awesome Con 2016) I had no idea what to expect. So I expected nothing. I enjoyed the event from behind my booth, taking pictures and admiring people in their costumes. 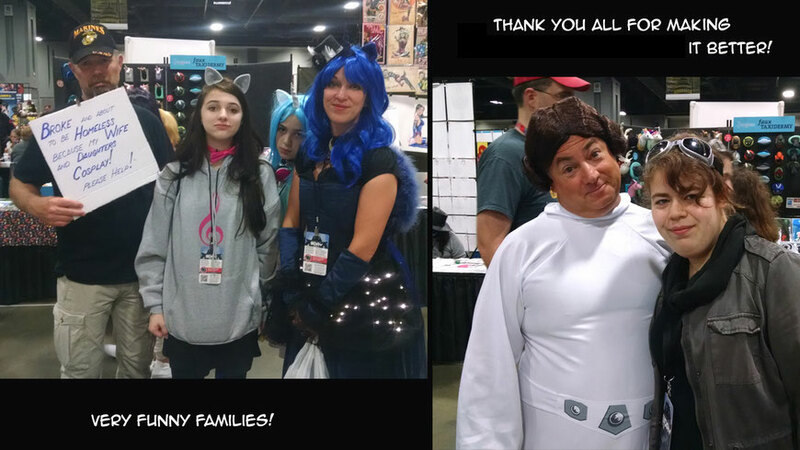 By showing them that I cared for their cosplay, their favorite characters and who they were I was able to speak and interact with a lot of diverse personalities. It showed me that I finally had found a place where I belong, and I couldn't wait to apply to the next show. This helped me to reduce the levels of anxiety. I had to find my own rituals to deal with will all of the details that cloud my mind. These are a few of the things that I do before a big event such as a convention. - I plan my table setup. I remember the love that I felt creating my stories and my art. I want people to look at my table and understand that more than seeing it as a business. - I try to keep things simple. 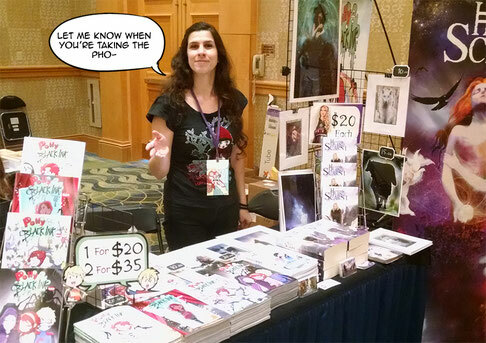 When someone approaches my table, they will see a lot of different art and sometimes styles. This is how my brain works. I create different projects at the same time, and it's ok... as long as I don't confuse my fans. - I make inventory lists, and I pack a few days before the event. I only take the best quality items I have. This takes away the stress of something missing or going wrong. - I dress comfortably. I set aside my favorite clothes. Sometimes those clothes invoke pleasant memories, like what I was wearing when I met my husband for the first time. Or what I wore to the interview at the United States of America Embassy in Paris when I got the approval to move to the USA and marry my better half. These clothes make me feel confident and happy. That helps me to be three days standing behind a table always with a smile on my face. - I take chances and initiate conversations with the attendees. I remember what is the most important thing to me: Let someone know of my work, or be worried if that person ignores or turns me down. 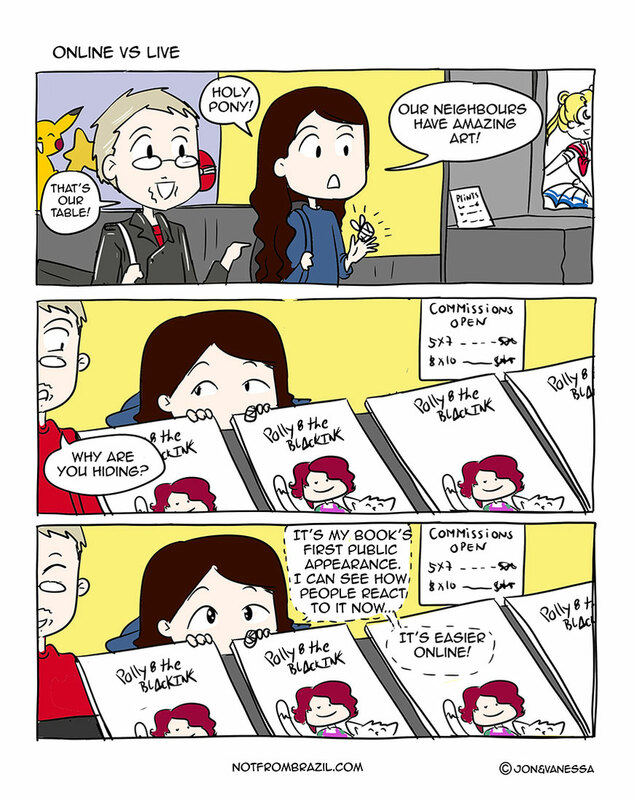 Sometimes we don't talk about the books or art at all. They just share all of the fun things they already saw at the convention - remember that I am stuck behind my table for three days, so I see the events through their eyes. - I set my expectations to zero and my effort to 500%. I stand there with my art. It's part of me... I give my best and let the rest work itself. Adding social media to all of it makes it more exciting. The people that are often just numbers, letters, strange worlds, creative or funny names and profile pictures. These people have a voice, they become characters in our lives and their lives become part of ours. We don't expect to meet them face to face. When that happens, it's like breathing life to our projects and making it real. I'm often so excited to meet my fans that I can barely sleep the night before. I forget what I wanted to thank them for and I forget to take a picture to save the memories of that day. I end up having to text them to come back so we can start all over. If they could only see that on this side of the table artist get nervous as well... and that we might stammer and even say something awkward... because we're human too. 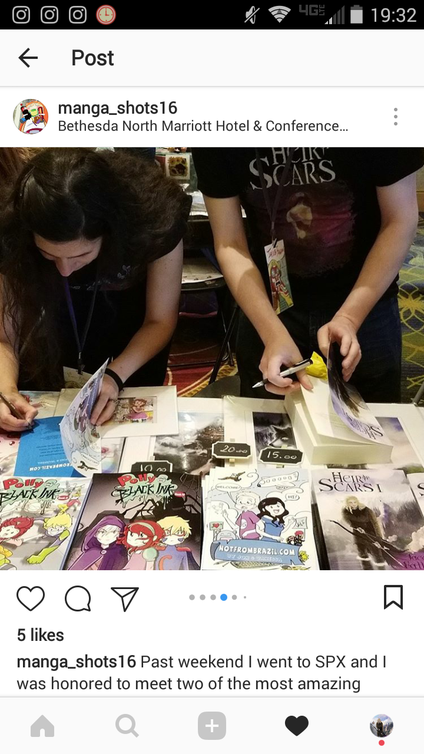 It's gets better when fans return the next day after reading half of Heir of Scars. Their smile is full of emotion and excitement and they let us know how happy and captivated they are by Adria's journey. It just makes my skin crawl seeing their honest emotions pour down as their eyes sparkle with twinkle stars and... oh wait... maybe all of that sparkling is just me looking at the fans through my own tears. It's such a great feeling to have feedback and see our hard work recognized... but to see and hear how our work reaches other people making them feel that good is even more rewarding. So thank you all to those who have made our projects real.